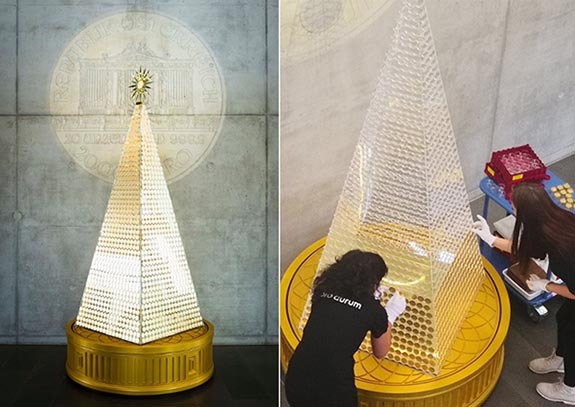 Munich-based gold dealer Pro Aurum recently unveiled Europe’s most expensive Christmas tree, a pyramid-shaped showstopper decorated with 2,018 solid gold coins and topped by a massive 20-ounce coin set into a golden star. 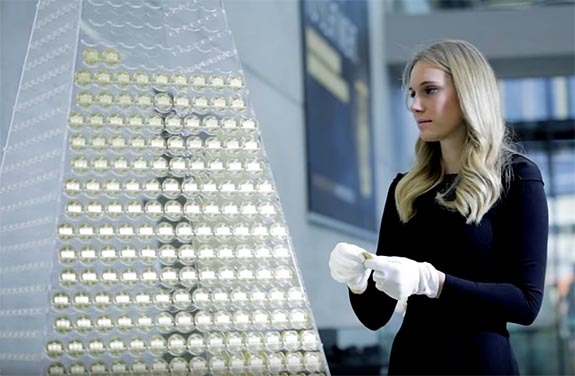 In total, the .9999 fine gold weighs 63 kilograms (about 2,222 ounces), putting the precious metal value at $2.7 million. The coins pay tribute to the Vienna Philharmonic and were designed by the Austrian Mint. The 10-foot-tall golden tree stands on a base that looks like Vienna’s Golden Hall of the Wiener Musikverein, regarded as the crown jewel among the world’s concert halls. The 20-ounce tree-topping coin, sometimes referred to as “Big Phil,” was originally issued in 2009 to commemorate the 20th anniversary of the Vienna Philharmonic coin. Displayed under heavy security in the lobby of Pro Aurum’s Goldhaus, the tree will be on display through Saturday, December 15.